Posted by Null in About Blogs. Do blog authors have any authencity of their published expressions or journals? There are thousands of trusted blogs which are read by millions. But are they really a legitimate source of information and ideas? WordPress, MySpace, Typepad and Blogger have encouraged many proletarians as regular authors and the information we are recieving might not be accurate or acceptable. For instance, a CEO’s blog does not necessarily symbolize that the information on his/her blog is valid. Till now I have not heard about any weblogs that you can call it as a legitimate source of information. Even the prominent Wikipedia raises the question of authenticity. I wonder if it can be possible to have some sort of peer reviewed blogs similar to the peer reviewed journals we have in academia. If that can be made possible, it would have been easier to identify the legitimate weblogs. More importantly, reviewed blogs could have been used for further referencing in other forms of social media. Posted by Null in Books, Ethics. 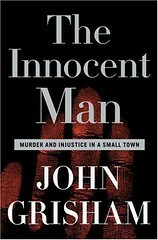 I have finished reading John Grisham’s recent work on a non-fiction novel named “The Innocent Man“. I expected the story to be a psychological crime thriller but I was wrong. The story has nothing to do with a typical fictional thriller. It is based on the real life experiences of some people of Ada, a small town of Oklahoma state. The story is quite bizzare that even in these days, innocent people can be framed by bad police work, snitches and loopholes of law. The story is mostly about Ron Williamson and Dennis Fritz who seemed to be innocent but were framed by the police of Ada and by the prosecutor Bill Peterson. These two individuals had been wrongfully convicted for the murder of Debbie Carter. The story also highlights another similar story of Ward and Fontenot who were also being framed and sent to the death row (“The Dreams of Ada” is the book about Ward and Fontenot by Robert Mayer). Since I was unaware that death penalty still exist in United States, I was quite surprised by these two cases. The book is worth reading if you still believe that the justice system protects the rights of the innocent. It will tour you the extreme state of affairs that any individual can undergo. Thanks to John for his non-fiction work and revisiting injustice.